There are a number of common diseases for fish that are easily treated. The most common is "Ich" or "ick", which comes from the Latin word for fish ("ich"). In this disease, the fish develops white spots over its body. It is also known as White Spot Disease. Read the discussion below for information on curing ich, fluke and fin rot. For an excellent detailed listing of types of tropical fish disease and treatments, link to National Fish Pharmaceuticals. Ich, ick or white spot disease are all names for the effects of a parasite called Ichthyophthirius multifilis. These parasites go through a life cycle that averages about 2 weeks in duration. Other diseases can cause the appearance of white spots too, so you can't always be certain that you are looking at ich. It is definitely the most common disease affecting freshwater tropical fish though. There is usually a factor which brings on an outbreak of ich. Possible sources include poor water quality, the introduction of water caring the disease and stress to fish causing their immunity levels to drop. Many tetras are easily stressed and after surviving a trip to a new home, their immunity levels will be reduced and they will be susceptible to low levels of ich in a tank where the original inhabitants are doing fine. It will appear that the tetras brought the ich to the new tank, but they can actually be reacting to small levels that were already present. Ich frequently affects tetras and clown loaches. It can also affect many other fish, including exotic plecos. Hundreds of tomites hatch from each cyst after about three days and swim free, looking for hosts. This is the stage when medications have the best impact. Tomites burrow through the skin of fish, causing stress and exposure to bacteria. Take action quickly, as ich will kill the infected fish in a few days. It will multiple and spread to other fish. Quarantine the affected fish. This will reduce the exposure of other fish. Increase the temperature a couple of degrees in the main tank and the quarantine tank to speed the life cycle of ich. Change a bucket full of water out of the affected tank. Try not to change too much water as an ammonia spike could occur and stress the fish further. Use aquarium salt in the main tank and the quarantine tank. In general most fish can tolerate low levels of salt. We suggest 1 tablespoon for 40 gallons as a preventative measure in most tanks. Wardley packages aquarium salt and it is sold at Walmart. For fish showing signs of ich, try a salt bath. For exotic plecos, our readers have suggested salt baths in a separate holding area for 5 to 10 minutes with concentrations of 4 or 5 times that in the tank they will be immediately returned to. Be prepared to repeat the treatment. Since ich goes through a life cycle another outbreak can occur within a few days. Malachite green - This is the most commonly suggested treatment. Malachite green is a very minor but powerful ingredient in Quick Cure. Malachite green is deadly to any fish. It is similar to using chemo therapy in cancer treatment on humans, as it damages the fish at the same time as it kills the parasite. Tetras do not tolerate this treatment well and it is especially hard on neons and cardinals. Back way off on recommended dosages. Quick Cure recommends 10 drops in a 20 gallon tank for tetras, but we recommend not more than 2 or 3 drops in a tank that size. You can get a half drop dose by releasing a drop in a cup of water, stirring and then discarding half the solution. For plecos the most common recommendation is to avoid using Quick Cure. Formalin - Formalin or formaldehyde is the main ingredient in Quick Cure. Novalec Inc sells formalin and malachite green separately, unlike Quick Cure by Aquarium Pharmaceuticals, which combines both ingredients. Copper sulphate - This is the main ingredient in Coppersafe and Aquari Sol. Coppersafe by Mardel Industries specifically indicates that it is safe for scaleless fish, but our readers have indicated to us that it isn't the way to go for exotic plecos. Stick with salt and salt baths for exotic plecos. Fin rot is a disease affecting fish with long, soft fins such as the Zebra Danio. A tank with good quality water is not likely to show signs of fin rot. It is most commonly introduced into a tank by new fish. Change 20% of your water to improve water quality. Add aquarium salt. This can be purchased from most pet stores. Add a teaspoonful for each 10 gallons or about three pinches of salt between two fingers. Most fish can easily tolerate small quantities of salt. This approach isn't recommended for scaleless fish such as plecos though. Add Mela Fix, which is made by Aquarium Pharmaceuticals Inc and contains melaleuca. It is recommended for fin and tail rot, open red sores, open body wounds, eye cloud, pop eye, body slime and mouth fungus. Carbon filters should be removed during treatment and water changes should be done after the treatment. Mela Fix is sold at pet stores. Add a penicillin based drug, such as tetracycline. Carbon filters should be removed during treatment and water changes should be done after the treatment. Tetracycline is sold by Aquarium Pharmaceuticals. You should see a rapid improvement in fin quality, as most fish will regenerate their fins. If not, it's time to quarantine affected fish. For a more detailed analysis of fin rot problems, visit National Fish Pharmaceuticals. Flukes are parasites that attach to the bodies of fish, especially the gills. Although flukes can cloud the skin color, the parasites do not usually produce a visually noticeable effect. 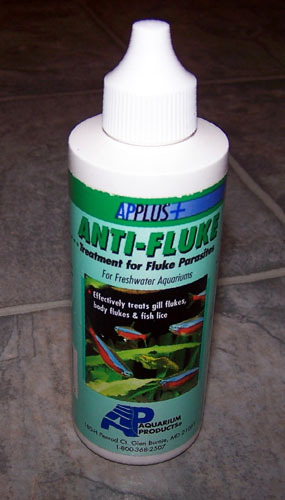 The most common evidence of flukes it based on the behavior of the fish. They will brush quickly against a rock or abrasive surface in an attempt to scratch the fluke from their body. A salt bath may be effective using 4 ounces of aquarium salt per 10 gallons. Also consider Prazipro by Hikari or Anti-Fluke by Aquarium Products. Comments by LittleHippyGirl: Treating ailments really depends on the species of fish and what symptoms they are showing. The first thing anyone should do is test the water quality. If you think that it is either a bacterial or fungal infection, treat them separately with jungle labs fungus clear. It fights both types. Combining medications can be dangerous unless the box clearly says they can mix. Salt is a good general medication because it fights types of parasitic, bacterial and fungal infections. The downside is that not all fish can deal with salt. Salt dips and baths have to be stronger since they are quick also. Tetras, young and small fish, catfish, and any "scaless" fish will not do well with salt. There are others too, but these are more general. Comments by LittleHippyGirl: This makes me so mad that Quick Cure does not put warnings and precautions on their product's packaging, because these mistakes are made all the time and are incredibly dangerous to fish. Quick Cure is a strong medication for ich and other parasite infections with two main active ingredients: Malachite Green and Formalin. Malachite Green is sensitive to light, and is usually sold in dark colored solid bottles at the store. When it comes in contact with light, it will become ineffective and it will not help your fish at all. Store in a dark place. When medicating a tank, cover the whole thing with thick dark towels or black trash bags, and keep the light in the room to a minimum. Formalin and salt do not mix, and this combination will make your fish even sicker than they were before. This is often true for other anti-parasite meds, so always research before mixing anything in the water. As formalin degrades and ages (goes out of date) it forms a white precopate. This is Paraformaldehyde and will kill fish! If you notice a white film or any white color to the medication at all, toss it out. Never use old medications, even if they don't have an expiration date. Never store Quick Cure in the fridge or let it get too cold, because it will become toxic and kill your fish when you do use it.